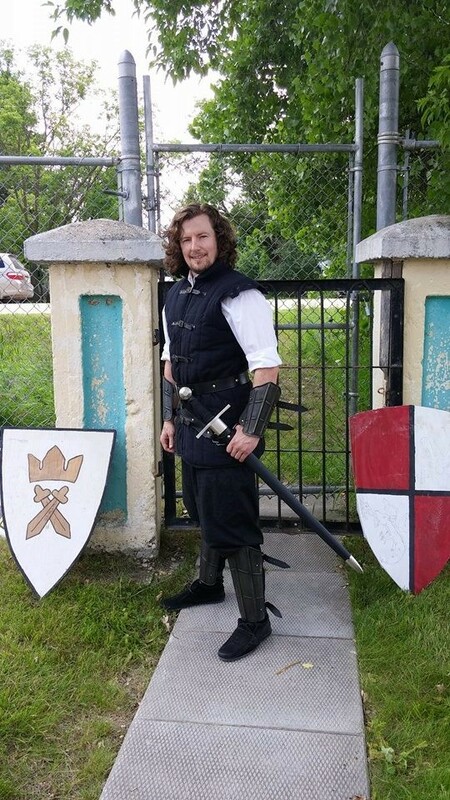 In our recent interview with Patrick Penning, the owner of LARP supplier Epic Armoury, we learned about the LARP industry, LARP equipment, and the worldwide LARP community. 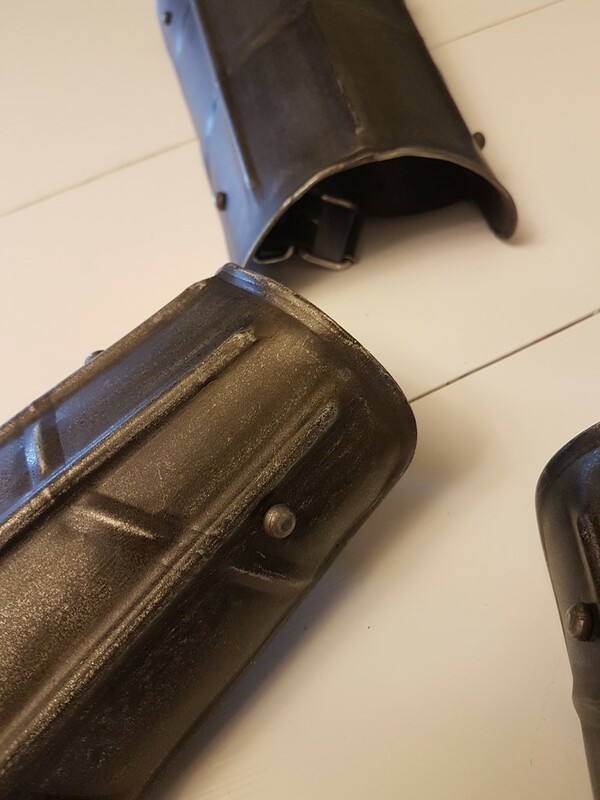 In our review of some LARP swords produced by Palnatoke and Epic Armoury, we took a look at the “tools of the trade” – the imitation weapons used to dish out equally imitation damage. But all the roleplaying chops in the world won’t help you immerse yourself in the game if you’re left in the position of whacking your friends with foam latex swords while wearing jeans and a Led Zepplin tshirt. Let’s face it – costumes aren’t just for fun, they provide the canvas on which you paint your character. They provide ambiance, pure and simple. Now, you can always throw on a bathrobe and call yourself a monk from a distant land, but if you’re interested in being a bit more period-accurate… you’re going to have to dress up. I don’t happen to be a LARPer per se, but I do like to dress up with my family and go to local Renaissance Faires and festivals. 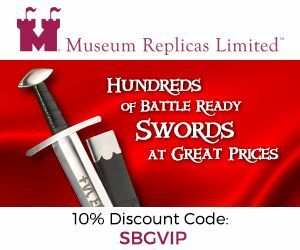 For this interview, the writer managed to collect, purchase, and dust off several pieces of Epic Armoury LARP gear – not only recent acquisitions, but some pieces that I purchased several years ago from Medieval Collectibles that wound up being Epic Armoury brand. As we are reviewing a great deal of gear, for the sake of space we will be spending a bit less time on each – though we hope the pictures and the amount of content will make up for it! 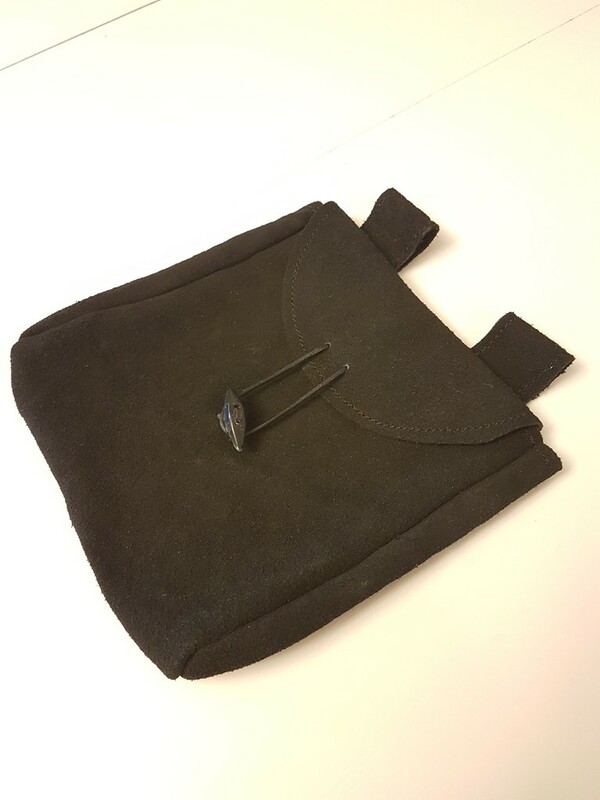 The first piece of gear I reviewed was a recent acquisition, a type of gear I’d noticed lacking at several occasions when dressing up for festivals. 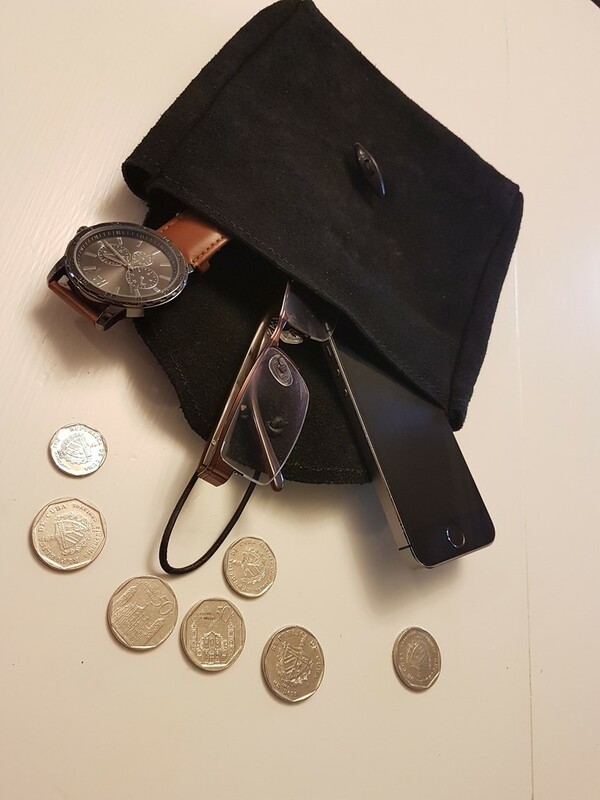 It comes down to a simple question – where the heck do I put my wallet and phone while I’m running around in pants with no pockets? I have tried multiple different options – sticking them in my boot, inside my tunic or Gambeson, carrying them around all day like a chump, and nothing worked well. I am completely mystified as to where historical knights put their wallets. What did Aragorn do with his iPhone? Such things keep me up at night. Fortunately, someone at Epic Armoury was way ahead of me. This leather bag is an incredibly simple and inexpensive (under $20) option for carrying my various anachronisms around the Faire. Made of a thin, layered leather, the bag is one of Epic Armoury’s lower-end pieces of leatherworking – that is, it is quite simple and has no frills or gimmicks. 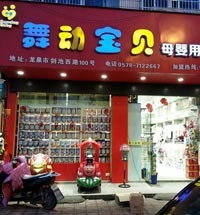 Despite that, I found the construction to be sound and solid and no defects anywhere to be seen. 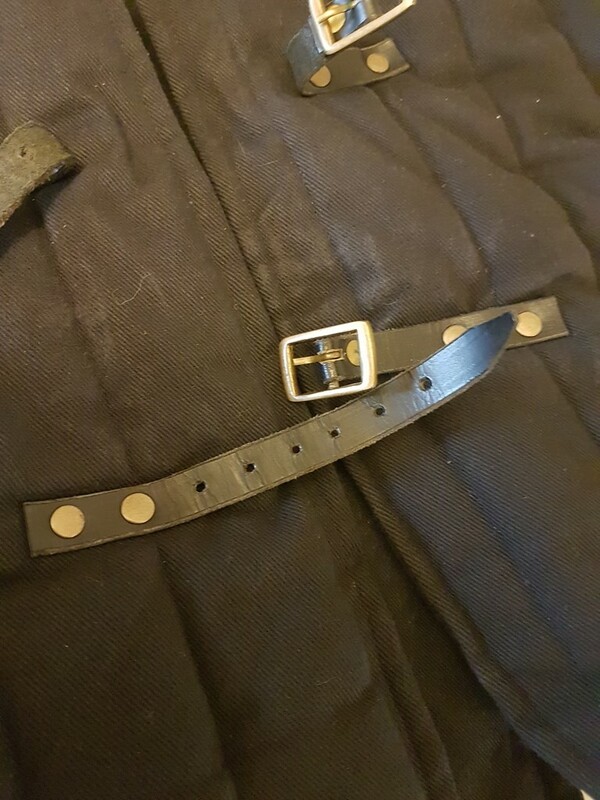 The bag attaches to the belt by way of two belt loops, and sat comfortably on my hip opposite the side my sword was hanging. I was impressed by how much I could fit inside! You don’t need to bring the kitchen sink to a Renn Faire (they didn’t have running water back then anyways), but you do need a few things – and this bag was more than big enough to hold the essentials. If I was willing to I could probably fit a small water bottle in there. For under $20 this was an absolute steal, and a great option for long days at the festival. Highly recommended. Cloaks – the little black dress of the Renaissance Faire. Big cloaks, little cloaks, fur cloaks (not during summer though, because wow) – you see cloaks on characters in period movies, fantasy movies, everywhere in fiction and history. You need a cloak, don’t you? You don’t even know why on a practical level, but how else can you turn dramatically, or throw back a hood to reveal your vengeful gaze, or otherwise be a total badass? Cloaks are a must, full stop. Cloaks are also crazy expensive, as a rule. You can expect to pay up to hundreds of dollars for some fabric to swish about your knees when you corner sharply. 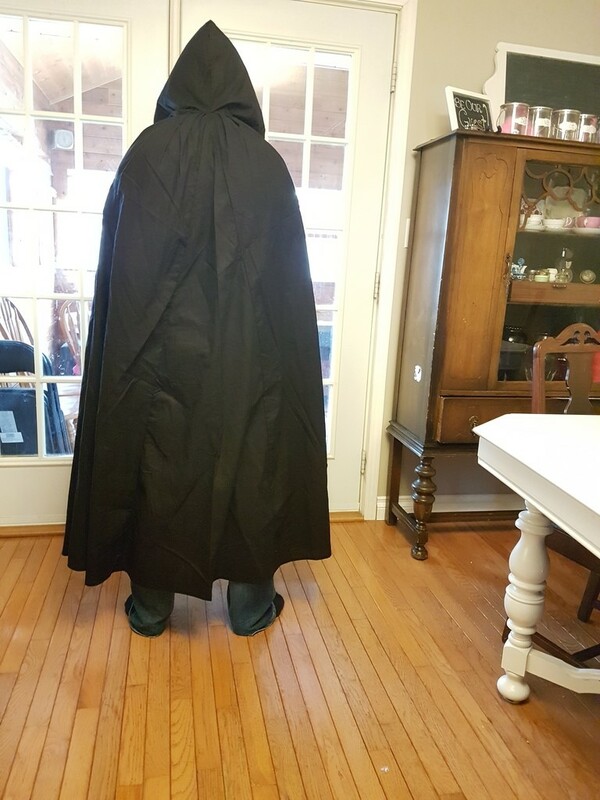 Which is why I was very happy to get my hands on a plain black cloak from Epic Armoury that didn’t break the bank. Unfortunately, cloaks are also a bit difficult to take photos of – I had a great photoshoot with this cloak on the white table like the rest of the gear, and all the pictures turned out looking like a pile of black fabric. Which is what the cloak is when it’s not on, but still. Not great photos of this one I’m afraid. 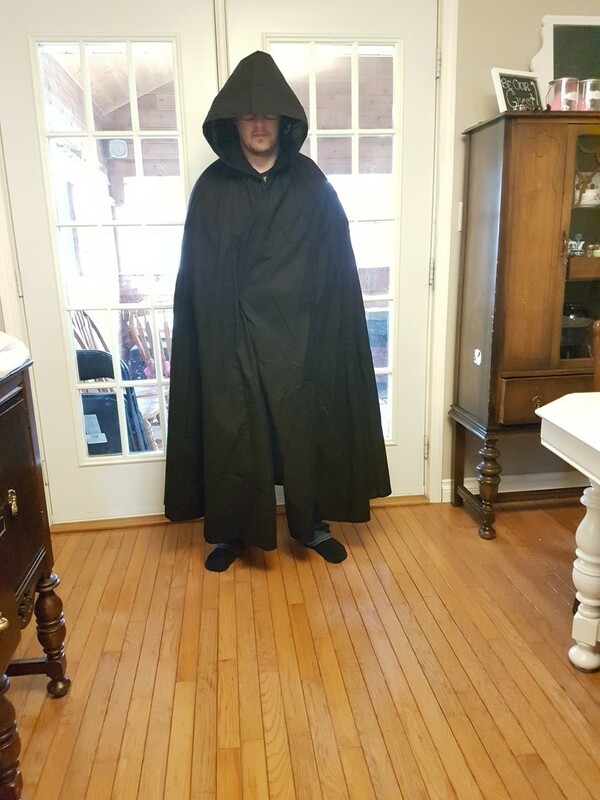 This cloak is a very plain, very simple thin black cotton. It is inexpensive ($51), and not too heavy – so you could wear it even on hot days. It covered down to my calves and had enough material that I could definitely keep a sword belted inside. 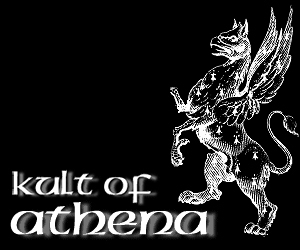 The material is too thin to be of much use as an actual weather-resistant piece of clothing – but if you are going LARPing on an extremely rainy day you might want to do it inside… overall as an inexpensive cloak, this is probably your best bet. A shot of the front – please ignore the jeans and socks. I’m not LARP-ready. (note – this review will be updated after Renn Faire season, when I have a chance to wear this gear in public and get better pictures). 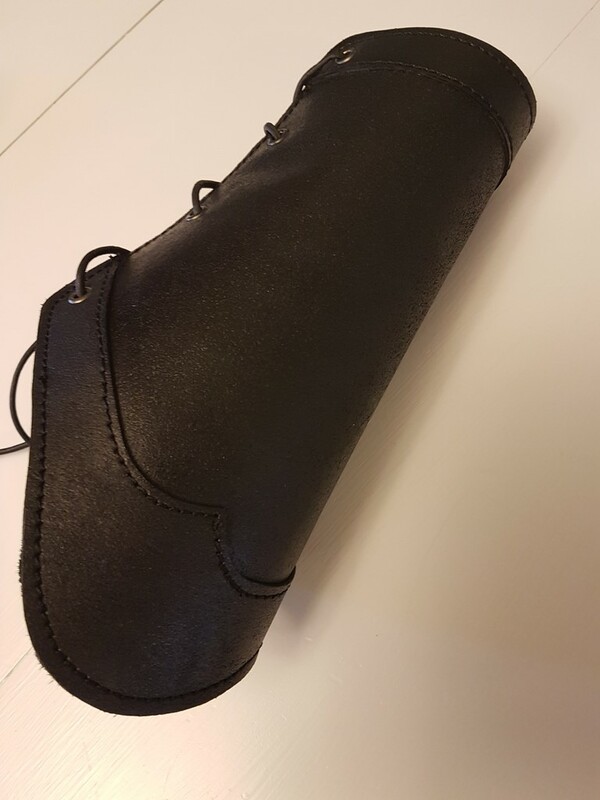 I actually tried making black leather bracers once. They turned out great – just two tubes of stiff leather, stained black, and ready to go in less than an hour. I did them the night before a small Renn Faire and didn’t bother to fine-tune them – so I was a little surprised when I couldn’t bend my arms very well in them. 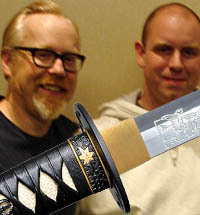 Drawing my sword was impossible, never-mind fighting with it. Clearly, I am not cut out to do this myself. 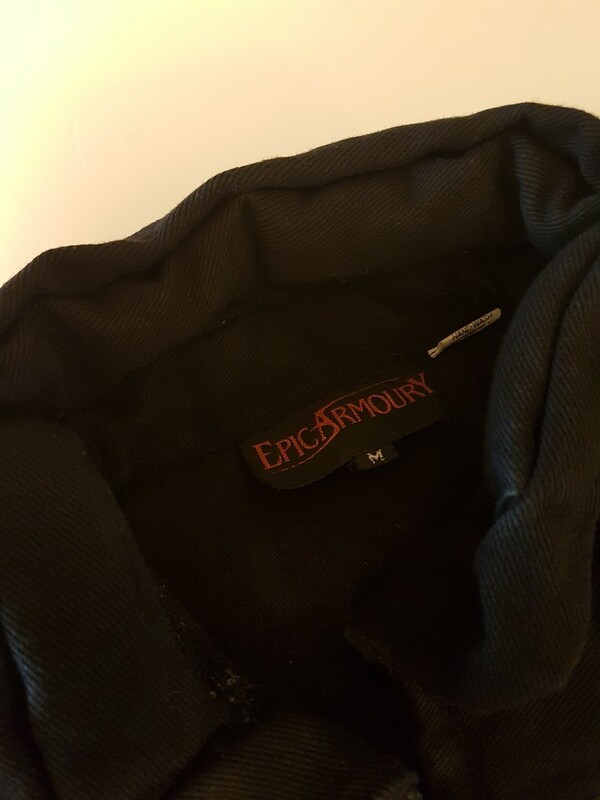 I was thrilled to find an inexpensive option at Epic Armoury that looked like it would suit me very well. 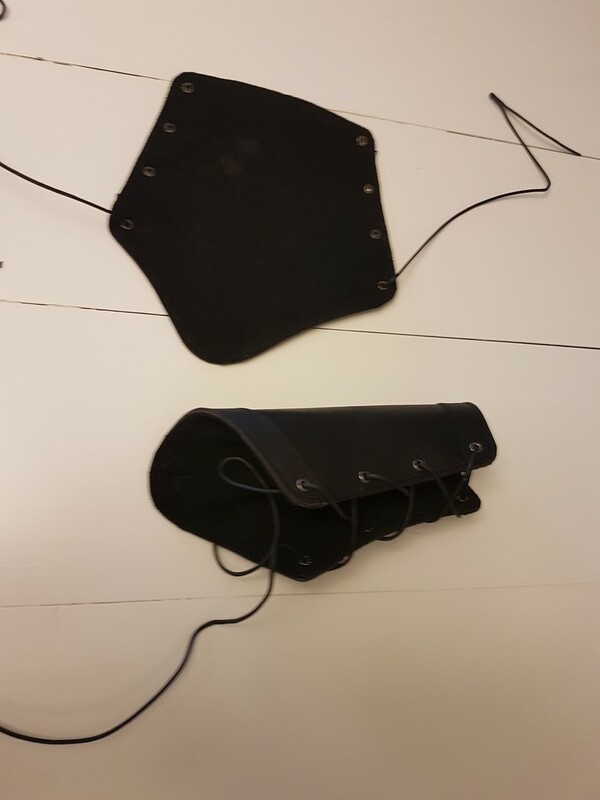 The Black Leather Warrior Bracers are a set of leather bracers with interlacing strings to tie and tighten as needed. They come in several sizes, and using their sizing guide I managed to pick out the perfect set for me. 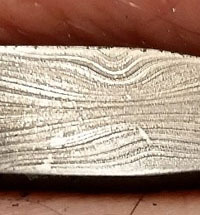 I was immediately impressed by the quality. These bracers are under $50 but were solid, well-constructed, and had very nice stitching. 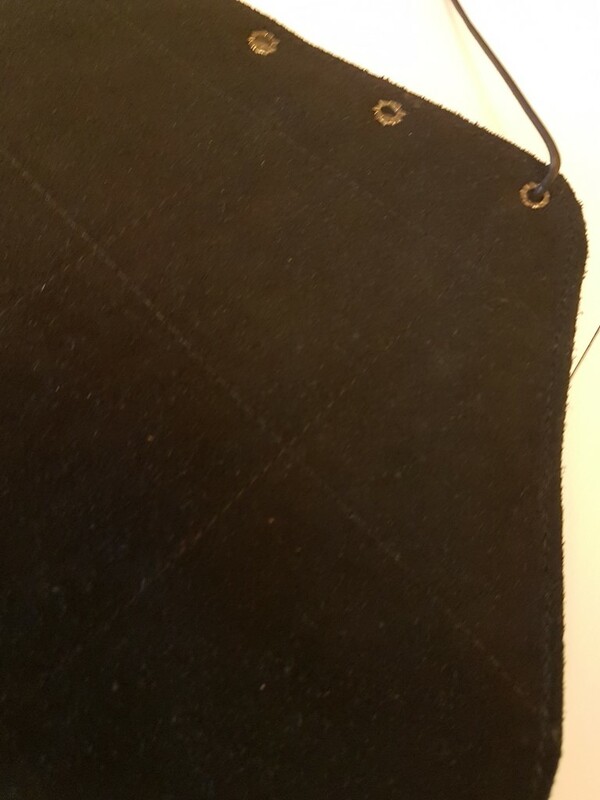 There were raised sections stitched on that added to the unique and authentic looking design. I really, really liked the look of them. 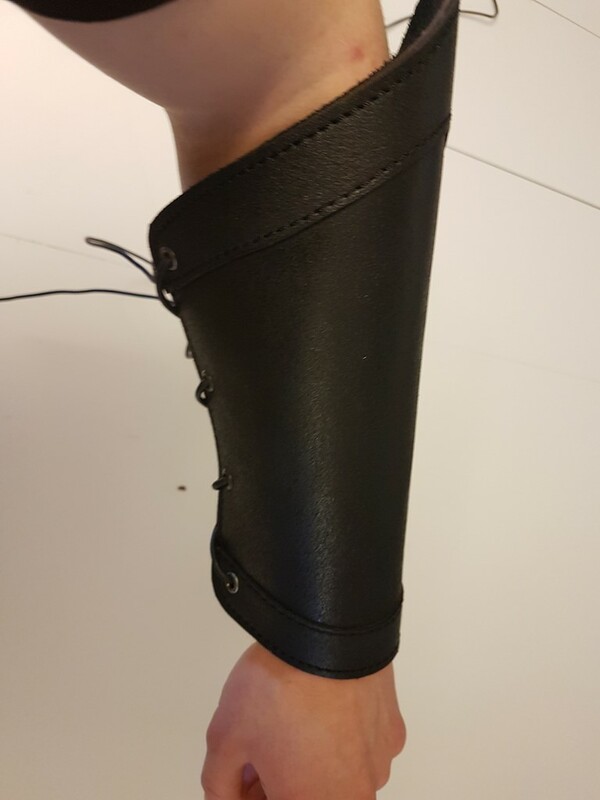 The liner was suede, which was a huge plus – these bracers were comfortable enough to wear on my bare skin, which I hadn’t planned on initially but will probably do in the future. They fit well over a long shirt, too. The biggest issue I had was lacing them up by myself, since it’s hard to do one-handed, my wife thinks I should be able to take care of myself, and neither of my kids are very good with knots (yet – good incentive to drag them to Renn Faires early so I can raise up little accomplices…). 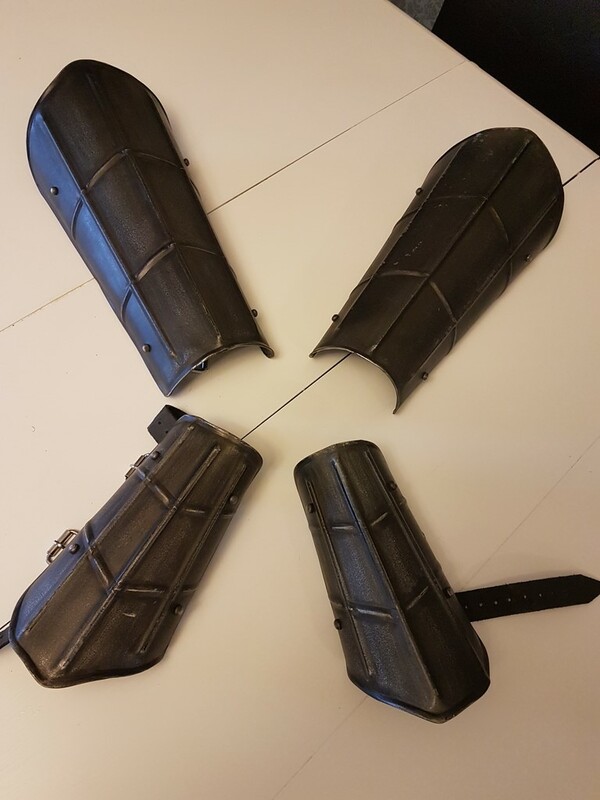 Overall I was extremely impressed with the quality of the Warrior Bracers, and plan to wear them all the time – possibly to work. In all seriousness, though, the quality for the price is outstanding. This was a job very well done. 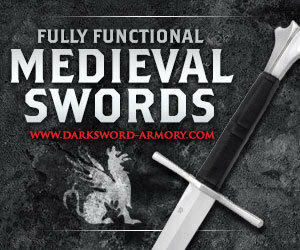 However – if (and I do mean if) someone were to try and cut my hand off while in a serious sword fight, these would provide minimal protection at best… what’s a guy to do when he needs a bit more protection for his arms and legs? I knew that I couldn’t afford a full set of armour, but if I was going to get anything I wanted to get some bracers and greaves. At $54 and $64, the Dark Drake set seemed to be right up my alley. 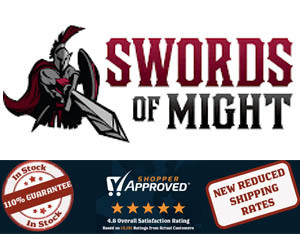 I couldn’t believe that I could get metal armour for such a low price, so admittedly I was skeptical… would these be ok quality? Would they be worth even that low price? Would they be junk? The Dark Drake bracers and greaves set is made out of a blackened steel, designed to resemble scales or other “dragonlike” qualities. The set goes well with a variety of different looks and I have worn them as parts of several different outfits. I was impressed with them out of the box as they did not seem to be flimsy or poorly constructed – they felt like real armour, and “clanked” reassuringly as I put them on and moved around. 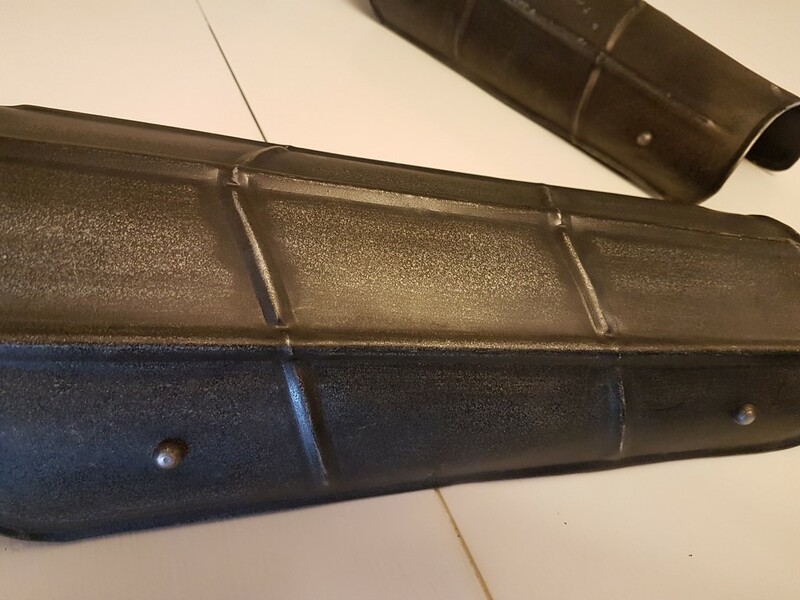 The steel is coated with what I assume is a powdered paint, and done so not only to make it look aged and worn but also to protect the steel from the elements. 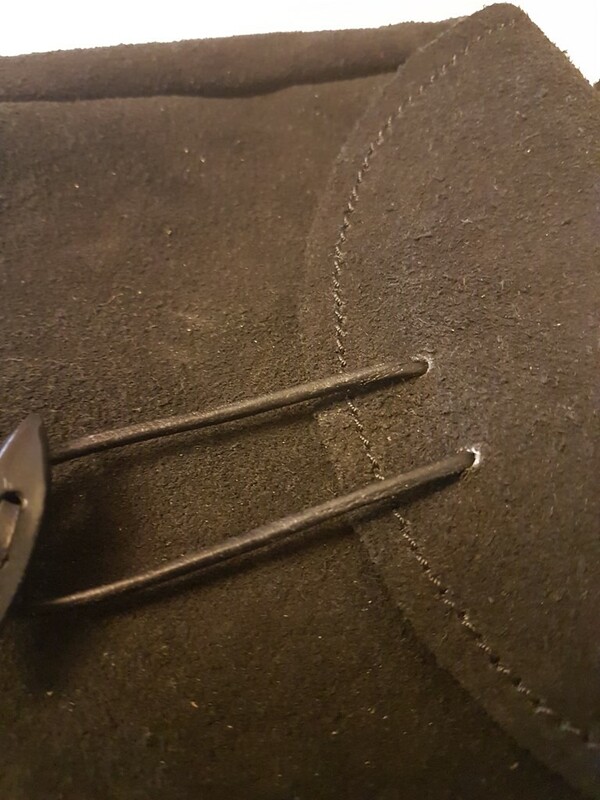 The rivets that hold the internal straps on add more realism – both at a distant and upon closer inspection, this looks like “real” armour. The straps of the armour are held on by two rivets each, and fit comfortably around the arm and leg. 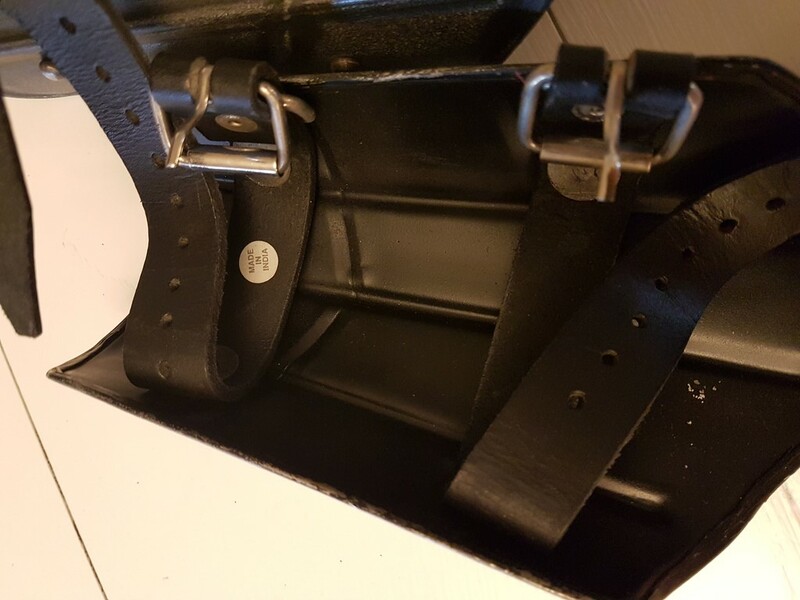 I actually ordered a size too small for my bracers (I ordered a medium and should have gotten the large); they fit a bit tight when on a bare arm, but are altogether too small when over a shirt or Gambeson. That’s fine with me, it’s been far too long since I ordered for a warranty exchange or something. But it’s good to get your measurements right when you order gear like this, especially if you plan to put them over clothes. You can still see the “made in India” sticker, 7 years after purchase and worn multiple times. That’s some high quality sticker right there. The Dark Drake Bracers and Greaves are just one set among many at Epic Armoury. While I expect that they are all fairly similar, I’m pleased with the set that I got. I like the fit and finish, I like the dragon-esque theme, And I like the price – getting metal armour for faires and festivals has never been so cheap. Full marks for these pieces in my book. 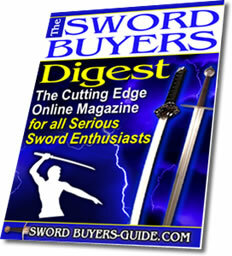 The last piece I’ll be reviewing for now is the Black Warrior Gambeson. Originally, I ordered the Gambeson with a plan to acquire enough armour to go overtop of it (probably chain mail) to make the Gambeson actually necessary for its function – which was, historically, as a padded garment worn under armour to absorb the shock of blows and prevent the armour one wore from doing more damage than good. 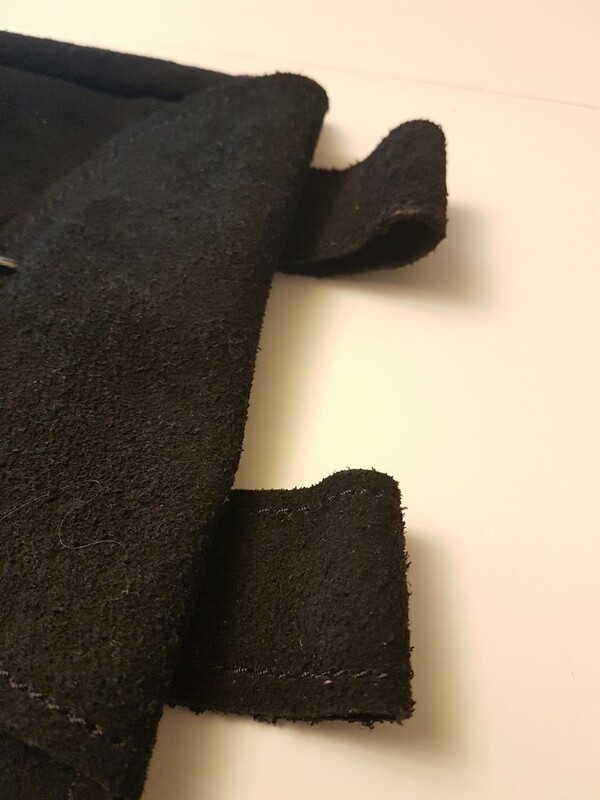 The Gambeson (pictured above without the removable sleeves, which I took off because my bracers wouldn’t fit over them) is a thick quilted black cotton or canvas upper garment. It has sleeves that can as I said be removed, and those are held on with laces at the shoulder. Lifting one’s arms exposes the armpit, which could be a vulnerable point should you actually be wearing this into combat – wearing a shirt underneath is advised, not just for that reason but for comfort as well. This is a very heavy article of clothing, and you are going to sweat quite a bit on hot days. What I started using this Gambeson for, actually, was not as a Gambeson at all. Once you remove the sleeves the Gambeson can be used as a doublet, adding a bit of period flair for a costume that needs it. I almost always wear it as a doublet, which is made easier by the fact that the strap and buckle closures are very attractive. 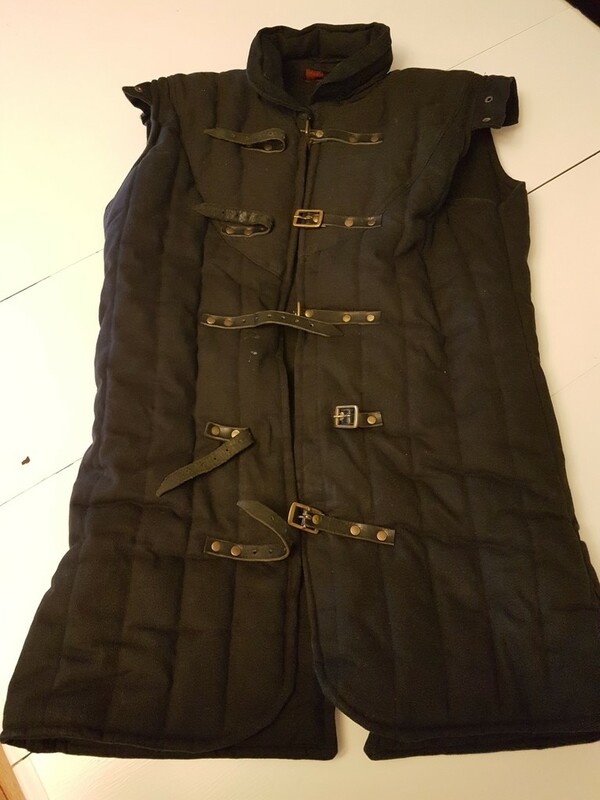 Simple, yet versatile, the Black Warrior Gambeson has been a valuable piece of my collection for several years. I’ve used it as the center of an outfit for a day of dressing up at the festival with the family, and always gotten compliments on it. It was less than $140, and that has made it one of the best value for the money purchases I’ve made in the last decade – I’ve gotten a lot of mileage out of it. And I’ll happily do it again this spring as the festival season gets started again. 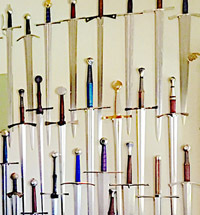 If you are a LARPer, you’ve probably heard of Epic Armoury. If you aren’t, you may still have – as I did, 7 years ago when I ordered some costume pieces for fun. 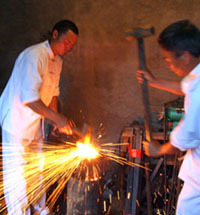 The truth is, their pieces – from leatherworking, metal armour, and period clothing/armingwear – are all of sufficient quality that they would be don-able for a huge variety of occasions. From the LARPing and Renn Faire scene to Halloween, costume parties, SCA events, or getting really into your tabletop gaming sessions – this gear has potential for so much. I’ll be honest, this will not be my last purchase from Epic Armoury. I’ve been extremely impressed with the quality of their work, the speed of their shipping, the customer service, and the commitment the staff have to the fun of what they do – they seem to understand that this is all for the joy of it, and that comes out in their interactions with the public and in their work. 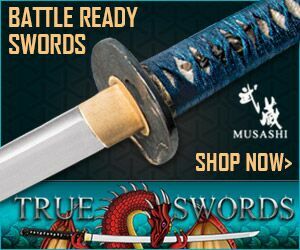 Sword collectors would get along well with the LARP community, and could certainly learn something from them – perhaps to take ourselves a little less seriously, to remember that this is something we do for pleasure, and to remember that we all came from the same place – a little boy or girl, imagining we were on a grand adventure. Perhaps we can keep trying to recapture that adventure, together.